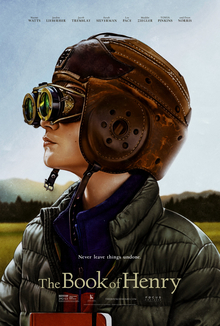 Critics panned The Book of Henry when it opened in June, but this may say more about their ability to step outside their pre-conceived ideas about what a movie “should be” than anything else. The film’s storyline conforms much more to what a reader would expect in a suspense novel than the conventional three-act structure—inciting incident, hero’s journey leading to dramatic climax, and then conclusion—taught in film school. This break from convention gives The Book of Henry unusual depth and sophistication in dealing with significant social issues, including the loss of a child from illness, the unwillingness of bystanders to stop child abuse, the meaning of parental responsibility, redemption, and the validity of vigilante justice. The Book of Henry is a conscious genre bender and does a remarkable job weaving the character arcs and personal journeys together to create a complete story and movie. The film begins with a story revolving around an 11-year old boy genius, Henry (Jaeden Lieberher, Midnight Special, The Confirmation) and his younger brother Peter (Jacob Tremblay, Room, Shut In), both of whom live in upstate New York with their single mother, Susan (Naomi Watts, Mulholland Drive, 21 Grams, The Impossible). Susan has all but abdicated her role as mother, allowing Henry to step in as a de facto father figure by virtue of his intelligence and precociousness. Henry’s smarts have enabled him to create a nice financial nest egg for his family, but his mother insists on working at a local diner as a waitress. Thus, the opening minutes suggest The Book of Henry is perhaps a redemption story about Susan told from the point of view of her children. Henry, however, discovers that Christina, the girl next door played by dancer Maddie Ziegler in her debut film role, is sexually abused by her stepfather Glen (Dean Norris, Breaking Bad, Little Miss Sunshine, Sons of Liberty). Driven by a strong sense of justice and ethics, Henry attempts to enlist his mother and other adults to help Christina, but to no avail. His frustration mounts as he grapples with intransigence, disbelief, and apathy. Adults either don’t believe an eleven year old, or are afraid to intervene. The stepfather, after all, is the police commissioner and well connected in the local community, creating a specter of retribution. As the principal of Henry’s school tells him, she needs more than the words of an 11 year old before she can accuse the police chief of child sexual abuse. Henry’s unexpected death dramatically shifts the film yet again to the point of view of Susan, who is emotionally unprepared to deal with his death let alone the full responsibility of parenting Peter and saving Christina. The remainder of the movie focuses on Susan’s coming to terms with Henry’s death, her challenges assuming the role of a parent, and her fumbling attempts to grapple with the consequences of Henry’s solution to ending Glen’s abuse of Christina. The Book of Henry wrestles with enormously complicated personal and social issues, and the screenwriter Greg Hurwitz (crime novelist and comic book writer, Orphan X, Batman: The Dark Knight) has masterfully weaved together varied individual character journeys to tell this layered and nuanced story. Henry goes from boy genius with the confidence to accomplish almost anything, to a frustrated pre-teen committed to an outlandish murder plot, to a scared child facing his own heartbreaking mortality. Susan’s arc takes her from irresponsibility enabled by her son’s unique abilities, to a parent struggling to reset her relationships and reground herself in the reality of parenting. All the supporting players have meaningful character arcs as well (including the stepfather), creating tension that pushes the story forward. Amidst this complexity, The Book of Henry doesn’t lose its grip on some of the weightiest issues in civil society: What are our individual responsibilities when our institutions are corrupt? What lines can be drawn in the name of justice and the protection of human life? Does the goal of saving of one human life from abuse and trauma justify the taking of another life? What responsibilities do those working within corrupt institutions have to intervene for the sake of justice, irrespective of the personal or professional risk? Henry’s perspective is clear. When challenged by an adult claiming that violence should be avoided at all costs, he says the one thing worse is apathy in the face of injustice. It’s up to his mother to test the truth of Henry’s statement. The Book of Henry is an ambitious film that dares to threaten the conventions of modern filmmaking. The movie is part coming of age, part tragedy, part Film Noir, and a lot Hitchcockian suspense. Some critics call this a “mess,” and lament the film doesn’t know “what it wants to be.” In fact, screenwriter Hurwitz and director Trevorrow know exactly what the film should be and keep it focused and cohesive. The second part (more Hitchcock) is intimately tied to the first part (tragedy). While not perfect, The Book of Henry deserves a far wider audience than its disappointing box office suggests. Viewers on Rotten Tomatoes give this movie stronger marks than critics by a 3:1 margin. While viewers are sometimes more generous because they reward entertainment over craft, in this case they may well have allowed themselves the latitude to enjoy a complex plot and story structure more typical of suspense novels than remain trapped in filmmaking conventions and genres.